It seems like pilot training never has an end in sight. Weather, plane scheduling, work schedules -- a bunch of things can interfere and stretch the process indefinitely. BUT, here I am, shortly before Christmas, with pretty much just a few hours of training needed to be ready for the checkride, and I've got it scheduled in the first two weeks of January. Checkride by the end of January? Maybe, possibly, if everything goes as planned or at least nearly as planned. At lunch with Eric G. yesterday, he said, "Dude, I'll be the first to go up with you." So I thought, okay, I'm close enough to start thinking about what I'll do when I can (finally) take a friend and fly somewhere. So this is my list of people who want to go flying, when that time shortly comes, and I'll update it as (if) it grows. If you want to be on this list, send me a comment. Today I flew solo from Gaithersburg to Potomac Airfield in Berkeley Springs, WV, then to Hagerstown in Maryland, then back to Gaithersburg. It was a perfect day to fly, except that when I left the wind was 12 knots, gusting to 17. Surprisingly, there's little to write about this trip. It was beautiful, very clear, with wide open blue skies. The visibility was more than 10 miles -- I could see the airport at Hagerstown from 14 miles, and Gaithersburg from 13+ when I was flying back. W35 is a tiny airport, with just a runway, no taxiways, no gas or services. The last few miles to the airport are along a river, and the approach to Runway 29 is over the river, with a low ridge to the left. There is also no weather information broadcast from the airport, so when I got to the airport I flew over it to look at the windsock on the ground, then circled out and around to land. I'm pretty happy with the smooth circles of my GPS track and the smooth rollout onto the downwind heading. The airport is so small there are no taxiways, so if you land and want to take off again, you have to turn around on the runway and taxi back down the runway. An airplane took off as I was approaching the airport, but there was not a soul on the ground, so I called Rich just to let him know I arrived there safely. 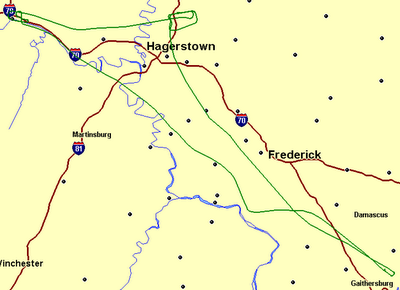 Then I took off and headed East to Hagerstown. I had to climb up to clear a low mountain ridge, then drop back down, because Hagerstown was only 20 miles away. When I landed at Hagerstown, I was cleared for a stop and go, so I landed, stopped, then took off again. Then I landed again and taxied to get gas. A lineman waved me in with hand signals, and literally put down a piece of red carpet for me to step onto when I got out of the plane. The lady inside was very friendly and signed my logbook just for fun. The flight back was uneventful, though even more beautiful with the sun low in the sky. A flock of crows was wheeling around near Sugarloaf Mountain, and I had to turn hard to avoid them. My landing at Gaithersburg was near-perfect, and I was fortunate to have a half dozen witnesses. Jodie was there, because SHE FLEW AGAIN WITH JOHN TODAY! (I think she had fun, too, though I don't know much about it yet.) There were also a couple guys from my flying club there working on a plane, and they saw the landing too. Perhaps the nicest touch was, after I was clear of the runway, a voice came over the radio and said, "Welcome back, Greg." It was Rich, who was there to head out for some instrument training. That, followed by Jodie running up to the plane as I got out to give me a hug -- those two things made a perfect conclusion to the flight. So today I finished my solo landings at a towered airport, my long solo cross-country, and.... Well, I wasn't in the air long enough to finish all of my solo cross-country time, so I have to do one more solo trip. No problem! I've had a couple questions from family about airports and runways. For example, how can there by a "Runway 32" if there aren't 31 other runways? So I took a satellite photo of the airport in Gaithersburg where I fly out of, and I superimposed the GPS track from my last flight over the photo of the airport. As you might remember from elementary or junior high school, we divide the compass into 360 degrees. North is 0 degrees, East is 90, South is 180, West is 270, and North is also 360 degrees. When we're flying, we generally talk about the direction we're headed. So if we're headed East, then our heading is 90 degrees. 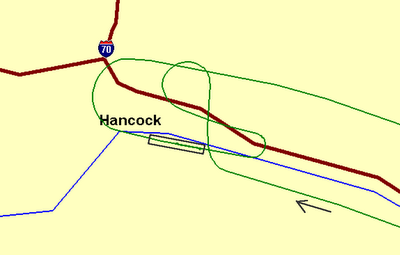 The runway at Gaithersburg is oriented roughly Northwest to Southeast. More specifically, if you stand at the Southeast end and look down the runway, the direction you're facing is Northwest, or about 320 degrees. If you stand at the other end and look down the runway, the Southeast direction you're facing is about 140 degrees. For aviation purposes, we just remove the zero at the end, so if you're taking off or landing in a northwest direction on the runway, you're on Runway 32. If you're taking off or landing in a southeast direction, you're on Runway 14. In my experience, the wind in Gaithersburg is usually blowing from the Northwest. Assuming that's the case, and since we always try to take off into the wind, we start at the Southeast end of the runway and roll toward the Northwest as we accelerate until we're moving fast enough to fly. That's Runway 32. We also land into the wind, so as I'm coming in to land, I'm flying Northwest, about 320 degrees on the compass, and I'm landing on Runway 32. 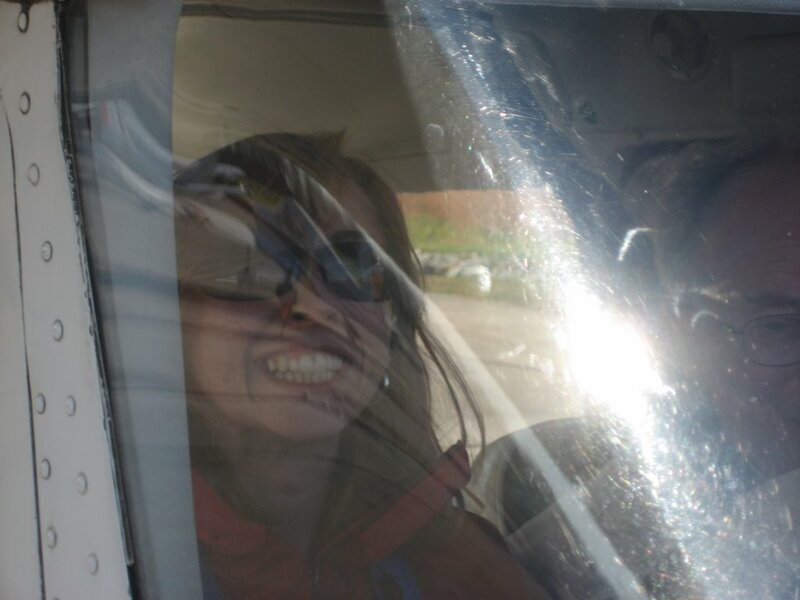 Jodie finished her Pinchhitter course yesterday morning, and she must have had some fun conversations, because last night she told me there are two airports she wants to fly to. Now, Jodie saying "I want to fly to...." is enough to get my attention at any time of day or night. As it stands, she's still decided that she won't fly with me until I've had my license for a year. The two airports she wants to fly to are Kentmorr (3W3) and Sky Bryce (VG18). Kentmorr is a small grass strip on Kent Island, in the Chesapeake Bay and just a couple miles south of the Bay Bridge. There was a writeup on it not long ago in one of the aviation magazines I'm subscribed to, and it looks like a neat place, with great crab cake restaurant(s) within walking distance. I do know from looking it up on Google Earth that the approach end of Runway 10 is AT the edge of the Chesapeake, so that should be a fun landing. It's also only 2400 feet long, plenty long for the airplanes I fly, but shorter than I'm used to. Sky Bryce is in the Virginia mountains and run by a ski resort. It is AT the ski resort, and you can walk from your plane to the lodge. I've heard that it's very cool, and there's been a trip there every year by a contingent from my club. Neither airport is far away, so these can definitely be fun trips a year or so from now when Jodie starts flying with me. Kentmorr and crabcakes in the summer, Sky Bryce and snowboarding in the winter! I spent a lot of time flying today, a total of 3.7 hours. The first 1.6 were spent on a flight in the newer Skyhawk owned by a club I recently joined. I've been flying Skyhawks all along, of course, but because it's newer, it has some differences, and I wanted my first flight to be with an instructor from the club. 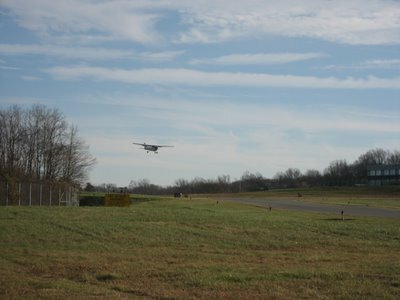 He also treated the flight as a mini-checkride, and had me plan a cross-country flight to Potomac Airfield. 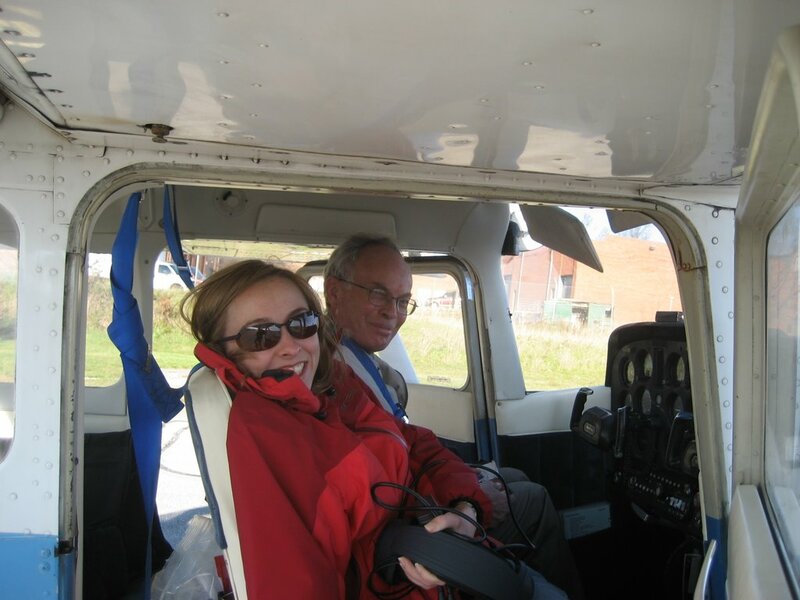 When we were halfway to Potomac, though, he had me do some maneuvers, slow flight, steep turns, a stall, etc., and then "divert" to Frederick, where we did three touch n' gos before heading back to Gaithersburg. He said I'll have no trouble passing my checkride, though he said I have a tendency to flare a bit high when landing. My second flight was the BIG one, my first cross-country trip by myself. 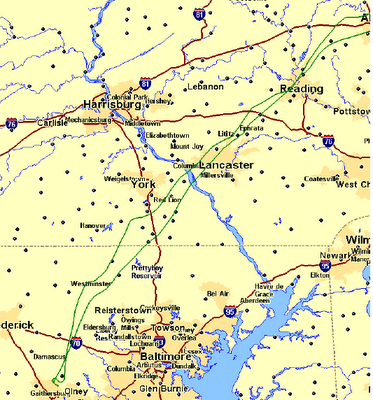 I planned the flight to Lancaster, Pennsylvania, and met with Rich on Thursday night to go over my flight plan. The weather was beautiful today, as clear as I've seen it (for this region) in a really long time. It was cold, though, and while the wind on the ground in Gaithersburg was light, the winds aloft were forecast at 21 knots, or nearly 25 mph. I took off and headed for my first visual checkpoint, a "tank farm," a grouping of big white oil tanks that can be seen for miles from the air. Before I even got to my first checkpoint I was being bounced around a bit in the plane. The flight continued, and the turbulence got a bit worse. When I was about halfway, some turbulence tipped the plane over on its right wing. I think that makes it qualify as "moderate" turbulence by formal definitions. It was worse than anything I've experienced since I started training, but it wasn't terrible and I wasn't scared. I just reduced my airspeed to below Va, or "maneuvering speed," and continued on. Before long, I crossed the Susquehanna (sp?) River and could see the Lancaster airport about 8 miles away. I listened on the radio for the winds, and they were "250 at 13." The tower cleared me to land on Runway 31, and I set up for the landing. I knew there was a cross-wind from the left, and compensated for it as I approached the runway. This involves "slipping" the plane, banking the plane to the left, into the wind, and using the right rudder to keep it lined up with the runway. The wind was a bit gusty, and at one point (for just a moment) I had the right rudder in all the way and still couldn't keep the plane straight. The landing was a bit bumpy, certainly not my best, but not all that bad considering everything. It was kind of like ALL my landings were when I was first learning. I stopped at the pilot shop and chatted with the owner, who signed my logbook to prove that I was there, then I called Rich to let him know I had arrived safely. I told him about the turbulence and cross-wind landing, and he asked if I had been nervous. I was surprised, when I thought about it, that I hadn't been nervous at all. That's either bad stupidity (not smart enough to know when to be afraid) or good confidence, I don't know which. I knew what to do, and I never felt unsafe, so I think it's probably just confidence in myself and the airplane, rather than stupidity, but.... Well, who am I to judge? When I left Lancaster, I demanded Runway 26, which was almost directly into the wind. The controller tried to make me go on 31, but I told him the cross-wind exceeded my limitations and he had me taxi for the other runway. With the wind nearly right down the runway, I was off the ground in about 600 feet, and I headed home. The flight home was beautiful. I was at a lower altitude, and the turbulence was lighter. As the sun sank lower in the sky, the turbulence went away altogether, and when I arrived back at Gaithersburg there was just a 3 knot wind, albeit straight across the runway. I made a nice landing, and taxied in. Overall, the trip went really well. Nothing made me nervous, and I did everything right, except.... In retrospect, I should have asked the controller in Lancaster to bring me in on Runway 26. For some reason, I never even thought about asking, I just factored the cross-wind into my approach to Runway 31. Maybe that's because I fly out of an airport with only one runway. Whatever, next time I'm going to be sure to ask for the runway I want based on the winds. Next cross-country -- maybe to Potomac airpark, the trip I planned for this morning but didn't complete. I'll talk to Rich and see. My GPS track is below. I wish I had pictures, because it was a beautiful, clear day, but when I took out my camera in the plane, the battery was dead. Rich and I flew a cross-country trip last night. 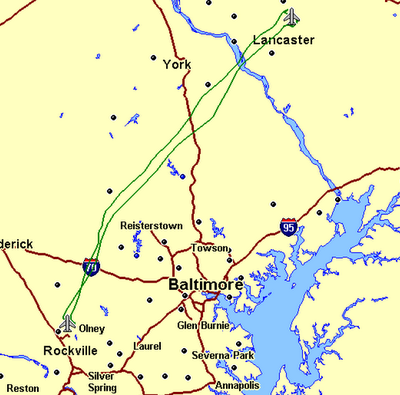 It's a requirement of pilot training to do a night flight with an instructor to another airport that is more than 100 miles, so I planned a flight from Gaithersburg, Maryland, 122 miles north to Lehigh Valley International Airport in Allentown, Pennsylvania. My regular flying club has been having maintenance issues with its planes, so I almost wasn't able to go. BUT I did recently join another club that does not have any such problems, and there was a plane available, so we took that one. Due to the trouble we had finding an airplane, Rich and I got a late start by about two hours, and we lifted off after 8:00. Neither Rich nor I had ever flown that particular plane, so we took extra time to familiarize ourselves with it and do a thorough preflight inspection. During the inspection, I discovered that the last person to fly it had left the gas tanks less than 1/4 full. The fuel service at the airport was closed, but there was fuel available in Allentown. I had done detailed fuel consumption calculations, and we had enough to fly to Allentown with required reserves, but I did not like cutting it that close at night. Since we had enough fuel, we went. It was VERY cold, about 10 degrees Fahrenheit, and we very quickly discovered that the airplane had no heat. My feet felt like blocks of ice, and Rich wrapped maps around his legs for extra warmth. The windshield apparently had leaks around the edges, and cold air was blowing on my face for the whole trip. Fortunately, it didn't take too long to get to Allentown, about an hour and a half. The flight was beautiful, slightly hazy but with a nearly full moon -- we flew over a reservoir, the Susquehanna River, and several airports. It was neat to see the airports down below us, and we turned on the runway lights of a couple with our radios. We were cleared by the Allentown tower to land on Runway 31, and I performed a beautiful cross-wind landing. Rich and I got a cup of coffee and warmed up while the linemen refueled the airplane. Then it was time to go back. It had been a very long day, and my GPS shows that I flew a decidedly curvy course back to Gaithersburg. We landed at Gaithersburg sometime around 12:30 a.m., and Rich ran to his truck to warm up while I secured the plane. It was a fun flight, and I'm glad to have that requirement in my training complete. However, next time I'd like to be warmer and less tired, and I think the experience will be an overall more enjoyable one. That may be after I have my license, though. Jodie's taking the Pinchhitter course. This is even bigger than the cake she baked me! The thought of flying makes her nervous, but not only is she supporting me in my obsession, she's actually taking the course and a couple hours of dual instruction! She's never even been in a small plane before! I dropped her off at the CAP trailer where the course is being given and then went to breakfast at the Airport Cafe with a fellow pilot. Two hours later I shivered in the cold outside the door to the trailer, nervous like an expectant father to see her reaction. She came bouncing out of the trailer talking a mile a minute - she had a question about barometric pressure, but "they" said flying's not hard, etc. We went back to the airport cafe with John (my instructor) so they could eat something, and chatted for a while as they ate. Then we went out to the plane. My plane of choice for her, 739BA, was not available, so we went to trusty 35R. John told me to do the preflight inspection of the airplane, making a comment about how I'm more thorough than he is -- for Jodie's benefit, I'm sure. Then John got in the left seat, and Jodie sat in the right seat. I hovered by the right door while John went through all of the controls and instruments with Jodie. After explaining what "COM1" and "COM2" were, John told Jodie he was going to use COM2 to check the weather. He turned the knob on the audio panel to COM1, and Jodie said, "I thought you were going to use COM2." I just about kissed her for paying such close attention, but decided I should leave them alone and went to the car to listen on my handheld radio. A couple minutes later the propeller started. I listened to the clearance frequency and heard John call for a transponder code, then I made a note of their code, just in case. When the plane started taxiing, I drove to the end of the active runway near the runup area, got out, listened to John make his calls on the CTAF, then watched as John, 35R, and my baby rolled down the runway and lifted into the air. I heard John make his radio call for crosswind, then no more. I was, once again, waiting like an expectant father. The wind had been blowing at 14, gusting to 21, and I was really worried it would be bumpy and Jodie would have a bad first impression of flying. An hour later, I was still waiting. Almost an hour and fifteen minutes after they left, I heard John announcing their arrival into the airport traffic pattern, and drove to the arrival end of the active runway. John made the radio calls, and I saw 35R on a slooooow final. The headwind was 15+, and the plane seemed to be barely moving across the ground. They touched down, right wheel first, came up slightly, then touched down again. I called on the radio, "Three Five Romeo, that was a nine point two." John's voice came over the radio, "Nine point two?" "That's right, Three Five Romeo, nine point two, niner decimal two." "She landed it," John said. "Make that a 10.0, Three Five Romeo, that was a perfect landing," I radioed as I got into the car to drive to the parking area. Jodie had a big smile on her face, but with a slightly guarded look. It turns out that John had had her take the controls right after takeoff, and she had spent the hour practicing turns, climbs, and descents all the way from Gaithersburg to Gettysburg and back. She had thought she was just going for a ride and that John would show her what HE was doing, not have HER do it, and I think she was a little overwhelmed. I'm hoping to get her to contribute her thoughts here, but if not I'll write more about what she told me a little later. For me, this was a great day, even though I didn't get into the air myself! Man, do I love that girl!